Paper Work explores the many ways artists incorporate paper as part of their artistic output and features over 50 artists from the Philadelphia-New Jersey region, including artists from Trenton’s A-TEAM and SAGE Coalition. We usually think of paper as a means by which we convey a message. Artists have traditionally used paper for sketching out ideas, recording in a journal, and for disseminating images, often copies: a vehicle rather than a final work of art. 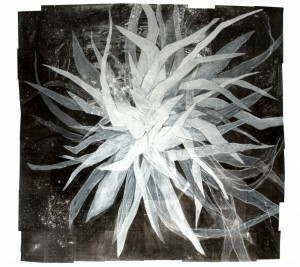 In the latter half of the 20th century, artists explored paper as a medium in and of itself and have since pushed the traditional boundaries through the use of collage, mixed media, alternative photo processes and sculpture, as well as through the innovative use of water-based paints and drawing implements that explore narratives, portraiture, and abstraction in fresh ways. Rather than a disposable commodity, paper has become intrinsic to the artistic process without the pretense of the canvas. Paper Work looks at the full range of ways in which artists use paper as a medium today. Printmaking is represented with etchings, monotypes, and prints that layer a variety of techniques in one image. Other works show different ways of approaching the printed surface to create different effects: cutting, carving, crumpling, and bonding, among other means. Some pieces even carve a presence in three-dimensional space in sculptural form. 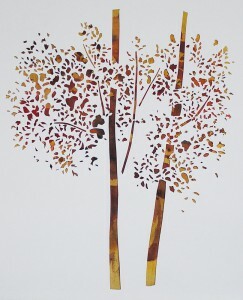 Curators for Paper Work are Elise Mannella and Gabriel Romeu. Elise Mannella, an artist, curator and activist, serves on the Trenton Museum Society’s Exhibits Committee. Her last show for Ellarslie was Naturally Made and In Full View: The Art of le Corbeau. She served on the Board of Art Works and co-founded Art All Night. Gabriel Romeu is a printmaker, furniture maker and sculptor, also in the Trenton area incorporating a variety of mediums in his work. Click here for a review of this exhibit.